Resonance is a collaborative, group exhibition by two painters, a sculptor, a filmmaker and a musician. Each one explores the changing environment of the planet and explores the concept of pollution. Alexandra Gould who came up with the idea for this exhibition and has curated it, has kindly spoken to us about the process and what goes into making a group exhibition happen. Ice caps dispersing to the ocean depths, warning fish looming out of the darkness and plastic fossils of modernity. Artists from Wiltshire are embracing the vast topic of climate change to interpret our planet’s transformation. They are creating paintings, film, sound landscapes and sculptures to go beneath the headlines and explore the human response to what is currently known of our planet’s condition. ‘Resonance’ is a timely exhibition of artists’ responses to a pressing subject, focusing them on new applications of their practice. It has also opened up a discussion about what is known of our planet and how we engage with that information. The event offers a creative and critical comment on our changing environment. Rachel Heard’s response is an investigation into the environmental repercussions as a consequence of global warming. Inspired by natural phenomena her expressionist paintings tackle the physical forms of submerging ice, contaminated water and earth scars of damage. For her 2018 Hadal Zone project Alexandra Gould was inspired by Marine Ecologist Dr. Alan Jamieson’s research trips. Combining his landmark discoveries of deep sea (Hadal Zone) pollution with the emotional response it evokes, she has created portraits of people and creatures to be valued and protected. Daniel Gould’s ‘Decompression’ is a self-portrait exploring the multiple environments of modern life. It is a series of sequences captured over the last twelve months whilst the artist travelled through South East Asia and America. Edited together to visually describe the frenetic and emotional impact of modern life, the film juxtaposes images of nature as a counterpoint to highlight how artificial city environments have become more familiar to us than forests and fields. His future fossil series represent the side effects of mankind’s progress over the last century. Each photograph is taken from an unusual perspective by the artist and printed on to waste remnants. They don’t feature people but show man’s impact upon our planet. Composer Stuart Bruce creates slow music for fast times, he has created a textural landscape that responds and resonates with the artworks. 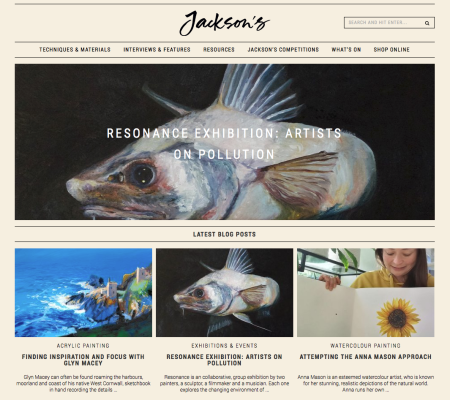 Inspired by his experiences and reflections on air pollution it weaves a connection through the themes of each artist and enriches the viewer’s encounter with the art. Rachel Reid’s sculptures give form to ideas about single use plastics and the impact on the planet. Combining familiar human and animal forms with plastics, her work invites the viewer to draw their own conclusions about how life and plastics should coexist. Also featuring an essay by art writer Katie Ackrill, the exhibition will guide the viewer through the influences and inspirations of the exhibiting artists. Resonance will have works available to purchase at a range of price. I’d heard the council’s Chamber room was available as an art space. It had been mentioned at my local art centre but it was by chance that I popped in to take a look for myself. Not how I’d imagined my exhibition, this wasn’t a gallery, there was no large display window to catch the eye of passers-by, in-fact there weren’t many passers by! Cluttered with tables and chairs it was tricky to negotiate definitely not an empty white cube but the room did have an old elegance and an unusual civic feel that could work. I’m aware that artists now exhibit in every way imaginable from rooftops to virtual spaces, in their homes to warehouses. I have previously exhibited my work in the old schoolhouse that’s now the art centre and it had looked at home around the unusual red tiled walls and odd architectural features. So being in a quiet country town hall didn’t rule out the chance of making exciting shifts in perception, it just made it harder to succeed. These possibilities sparked an idea. I should collaborate, share the challenge and create a totally new body of work. Collaboration is at the heart of a successful group exhibition, we’d need a shared challenge, fresh ideas and a reason not to back out. I was confident I could coordinate an exhibition, but could it inspire people and be meaningful? As the data driven generation we need to discern and understand the information before making changes. After careful thought the theme and title ‘Resonance’ presented itself. It embodied bigger questions, how the news of pollution resonates with us? What is the impact? How do we make sense of the overwhelming knowledge of human pollution and what elements of this would we chose to communicate through art? In early 2018, I’d been at a private view and met a charming woman, who told me about her daughter, a humanitarian aid worker and sculptor. Her name is Rachel Reid and her sculpture is very emotional. Seeing it online felt personal, the work, forged as much out of experience as creative intention. Each sculpture seems from the past. An unknown outcome of Rachel’s experiences, the people she’d met and disasters she’d witnessed. Solidified in bronze and clay, like headstones, the sense of loss was somehow integral. An expression made solid to be seen, felt and considered. At last years annual open art exhibition in Corsham, I spotted Rachel Heard. She was exhibiting a large abstract painting that tightly hugged the wall in a brightly lit corner. It was like glimpsing someone else’s underwater memory, the dripped paint resolving into a physical marine environment. I resolved that Rachel Heard would need to be in the exhibition. Last year I joined a local art café and began a conversation with the leader Katie Ackrill. There was something about Katie’s demeanour that I gravitated towards. Katie was more than a curator and visual arts leader, she also wrote essays to maintain a critical eye on art works. Her blog was a personal exploration of art history and specific works of art. I had hoped I’d find a way to work with her. Approaching all three women with the opportunity, I discovered they were interested. Rachel Reid and Rachel Heard were on board, Katie was keen to hear more and when asked to write an essay she eagerly accepted. A sculptor, two painters and a writer; looking again at the calm grey Chamber interior I saw the black screen above the marble fireplace dominating the room and knew this challenging void needed a film. Married to the filmmaker Daniel Gould, I am inspired by him and his artful eye for stories. He creates his films with a strong narrative, always visually exciting with impressive sound design they intentionally draw on emotions. A film director by profession he’s also a writer and artist. Finally a suggestion by a friend to discuss music with Stuart Bruce proved to be fruitful. A composer and music producer, he’s experimenting with sound landscapes and the concept of this exhibition created a focus that Stuart found compelling. As the final artist committed to the exhibition my confidence swelled. After a national bank declined I sought advice and included an additional feature. The value of sponsorship would be deductible from any future commissions with a contributing artist. Next a legal firm declined our proposal and later three more organisations followed suit. A lack of funding or a mismatch of criteria, were the standard responses so we adapted to a self-funded exhibition. National funding is available for ‘formal’ art groups or charities and some of the companies we approached have initiated such schemes. However by formalising the group (which involves bank accounts, signatories, etc) it loses it’s collaborative spontaneity. Historically even collectives built on friendships only thrive for a few years and then get controlled by a select few or stagnation sets in. So committed to the one off ‘Resonance’ art exhibition, all artists agreed to fund the project and make savings where possible. This rallying around was beneficial for morale. Creating shared pinterest boards to help maintain motivation seemed a good way to stay in touch over the coming months. While Rachel Reid looked to sculpting with plastics, Rachel Heard was inspired by natural phenomenon. Daniel Gould’s work centred on the personal urban experience and Stuart Bruce was drawn to sounds, contrasting harmony with the discordant. I was drawn to the scientific research specifically of our least known ecosystems on the planet – the deep sea. Each artist was responsible for creating art and getting it ready for display. Also, while the council insured the room, each artist was responsible for insuring their own work and completing sales from the event. This balance of artists administrating their own art and my coordination of the exhibition meant artists could still work independently and remotely towards the common goal. Due to a lack of funding, we only printed posters as a collective. While some artists embraced social media platforms for promoting the event others paid for personalised invites for the private view. The planned brochure was broken into elements for use online and all biographies and information about the artwork on display was printed on domestic printers for the two display books at the event. A printed banner was replaced with a handmade canvas banner, we responded to the theme and made an eco friendly choice. Assisting with graphic design to help out and maintain continuity, I concluded that there are many different skills required to create an art exhibition not least of which was flexibility. The advertising of the event falls into several categories, the online social promotion, the printed promotion and press articles. Having resolved print, created images and straplines for social media, the press articles were next. Katie Ackrill was writing the essay, as she was sent the biography information, images and descriptions of the work I collated it all as the foundation for websites and the exhibition display book. I wrote and rewrote the press release and I have to thank Daniel Gould for editing all my writing. With each painting I create I realise that each requires an explanation, a way into the painting to make it accessible and to show my intention. It is with that rationale that I have created articles to describe our experience that might interest or inspire others. Also being keen to spread the link between art and science in my own work I felt compelled to write about the art and science relationship. As each artist completes their work and the date of the private view gets closer we will post the invites, push the social media messages and print the articles both real and virtual. I have layout plans and measurements at the ready. The private view will be the culmination of months of work and challenges – all worthwhile, all invaluable experiences and very rewarding. I am very proud to be working with such fine artists as Rachel Reid, Rachel Heard, Daniel Gould, Stuart Bruce and Katie Ackrill.